These green spears are a harbinger of tasty spring produce and can be blanched, barbecued, roasted or fried until they're sweet, verdant and mouthwateringly good. Here are our favourite recipes that put them centre stage. Asparagus is available year-round, imported from places like Peru and Mexico. But the real deal (which doesn't arrive with the baggage of excessive air miles and a whole load of deforestation) only comes around once a year, ushering in the best of spring’s bounty and paving the way for lots of fresh, green and very tasty dishes that’ll last until the end of summer. 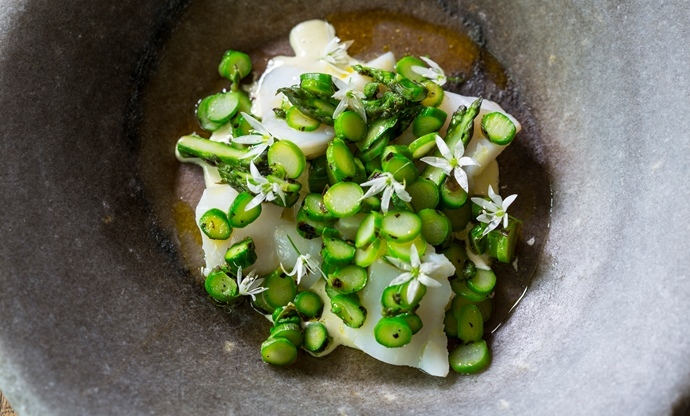 Yes, British asparagus is in a different league entirely, sending chefs into a frenzy (they always manage to get it a few weeks earlier than the rest of us) and filling home cooks with giddy excitement. 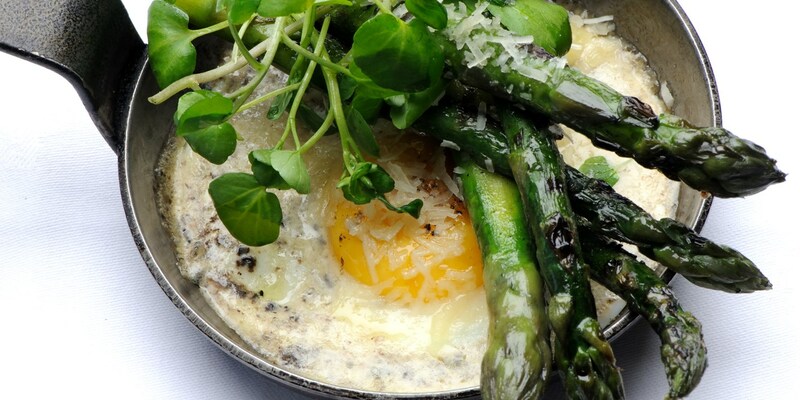 But while they’re great simply blanched and served on their own, asparagus spears can be cooked in all sorts of ways. They pair fantastically well with a good number of other seasonal ingredients, too, so they can become the star of a dish instead of a vegetable on the side. Take a look at the recipes below and make the most of one of the UK’s finest crops. When they’re young and freshly picked, asparagus spears don’t even need to be cooked – something Paul Ainsworth knows only too well. 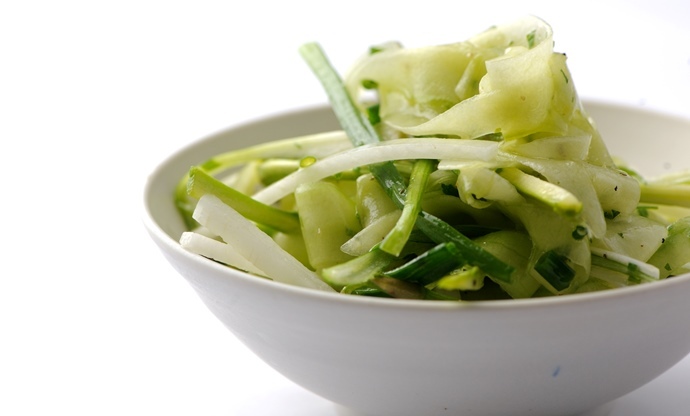 Simply split them down the middle, mix them up with lots of other lovely springtime produce (radishes, cucumber, spring onions and chives) and give them a simple dressing of lemon juice and olive oil. Barbecue season is still a way off when the first asparagus appears in mid-April, but if you’re itching to get the barbecue out make sure you save some space on the grill for a few of these tender spears. Charring adds another dimension to their sweet flavour, and they're ready to eat in a matter of minutes (just don’t let them fall through the grate onto the coals below). Making your own mayonnaise with British rapeseed oil is another nice touch – after all, asparagus spears are the perfect shape for dunking. Nathan Outlaw may be best known for his exemplary touch with fish and seafood, but he's a master when it comes to rustic, delicious vegetable dishes too. 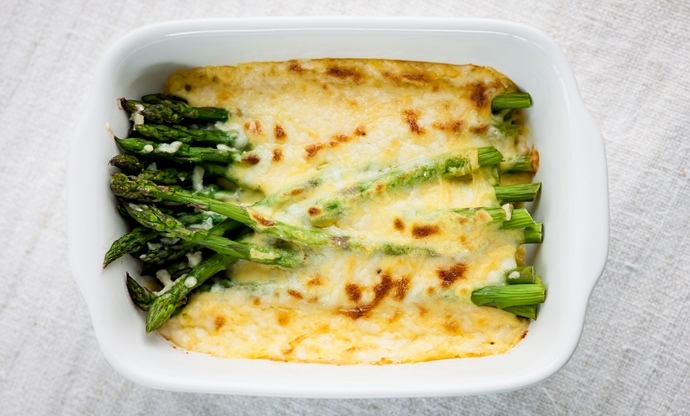 Cauliflower cheese is so old-school – Nathan gives the dish a new lease of life by swapping the brassica for lovely tender asparagus. A little mustard and some Worcestershire sauce gives the dish a bit of a kick, while the quick blanching of the asparagus before it goes in the oven ensures each spear is perfectly cooked. The joy of eating British asparagus in season is in its amazing flavour and freshness – if you have a beautiful bunch of asparagus, sometimes your best bet is to keep things simple and let the accompaniments do the talking. 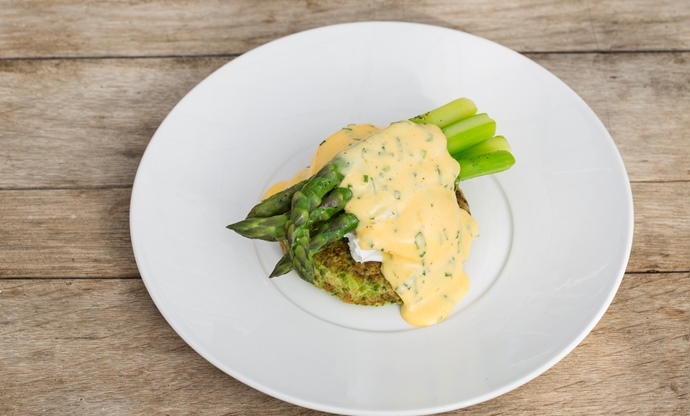 This brunch dish from Tom Aikens does exactly that – the effort in this recipe goes into the lovely fluffy pea pancake and a herby sabayon sauce, whilst the asparagus is gently blanched in salted water and served at the last minute. Asparagus looks beautiful in its natural form, but if you’re nifty with a knife they look just as pretty sliced into neat little discs. That’s exactly what Robin Gill does, so he can scatter them over a plate of butter-poached cod and wild garlic-flavoured miso. 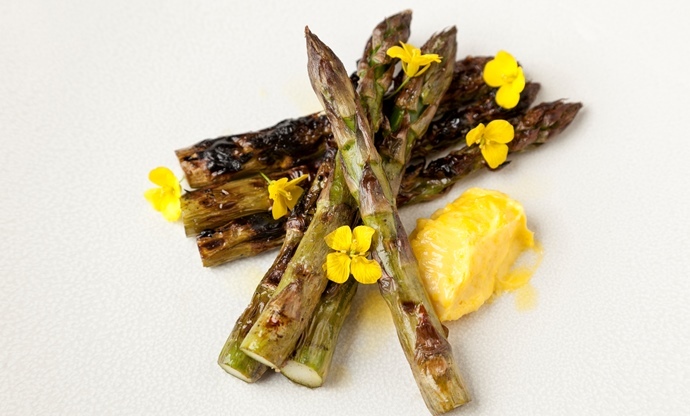 Robin barbecues his asparagus first to add a bit of extra depth – the result is a particularly pretty dish that offers something a little different for spring. 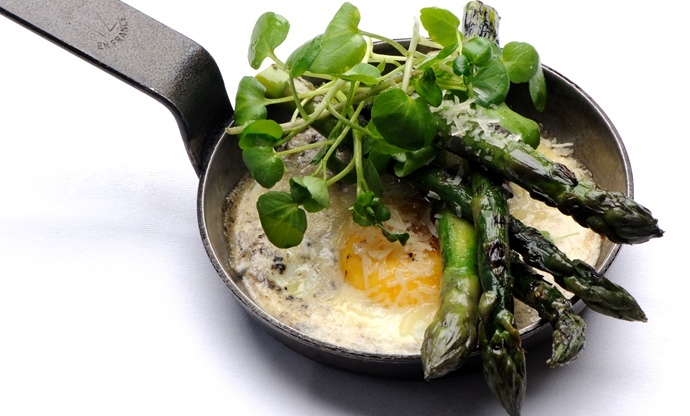 Duck eggs and asparagus are a match made in heaven – those long spears are perfect for dunking into a runny egg yolk. But do you know what makes it even better? A scattering of black truffle and Parmesan with a dash of double cream. Josh Eggleton's luxurious starter has a rustic look about it, but it's rich and decadent – perfect for a celebratory breakfast or dinner party starter. What’s more, it takes less than half an hour to cook! How do you make the world’s most expensive asparagus spear? Roll it in grated truffle, of course! While that might be a bit rich for some people’s blood, the accompanying asparagus soup is silky, indulgent and sports an incredibly vibrant colour. If you happen to have a spare truffle lying around, it really adds to the dish, but the soup alone makes for a fantastic al fresco summer lunch. 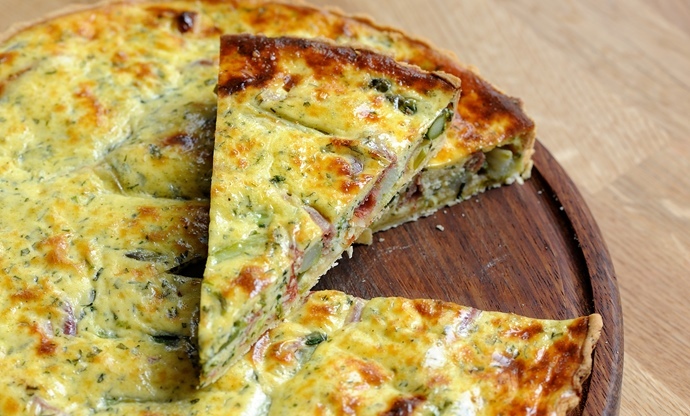 Asparagus is always paired with eggs, so it makes perfect sense to bake it into a quiche. Tom Aikens adds chervil – an underrated herb which has a light aniseed flavour – a generous amount of Parma ham and rich mascarpone. Add in the buttery crunch of Tom's flaky shortcrust pastry base and this may just be one of the best quiches we've ever eaten. 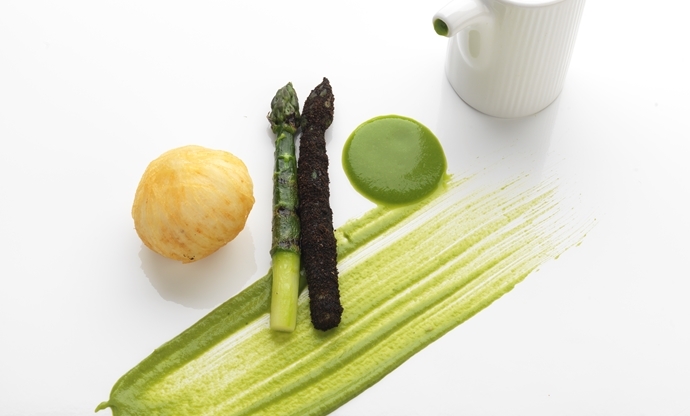 It looks incredibly simple, but as you'd expect from Sat Bains – head chef of two Michelin-starred Restaurant Sat Bains in Nottingham – there's more to this asparagus dish than meets the eye. Asparagus and hollandaise is a classic combination, but Sat elevates that with air-dried salami and notes of hay in the sauce. The result is a true showstopper, suitable for dinner parties where you really want to impress. 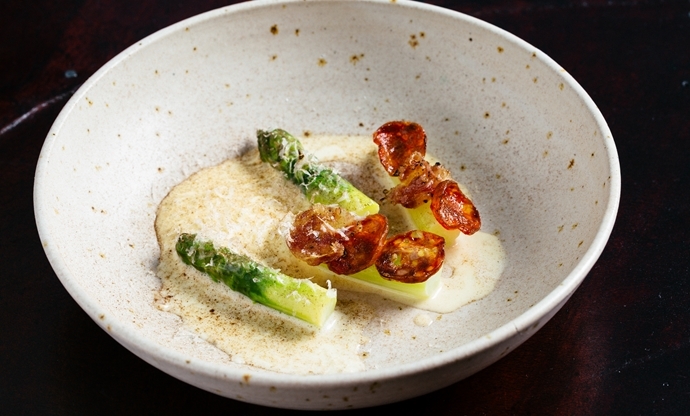 Joey O'Hare always shows a fantastic understanding of flavours in her recipes, and this dish is no different, pairing pan-roasted asparagus with wild garlic, spring onion and hazelnut. 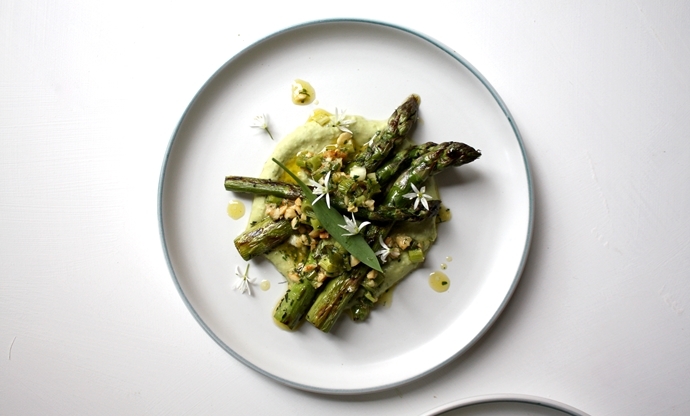 Joey roasts spring onions to take any harshness out of them, then mixes with hazelnuts to make a pesto, providing lots of textural contrast again the smooth wild garlic hummus and tender asparagus spears.